“Colorfully scored for small orchestra and ably led by Gaffigan, it conjures the effect of a solar eclipse on animals and the environment. This piece is the acoustic depiction of a total eclipse of the sun which I witnessed in 1999 in my home town in Germany. We went to the countryside, where the animals of the fields and forests were the first to sense that there’s something wrong with this particular day. The atmosphere was very peculiar, because the bizarre but peaceful evening mood at noon was disturbed by the distressed cries of all animals around. This is where the piece starts. As the light started to fade, the animals fell completely quiet suddenly and gave way to a short appearance of equally confused crickets, followed by a sudden drop in temperature and an eerie silence hanging over the landscape (second section: Nightrise). 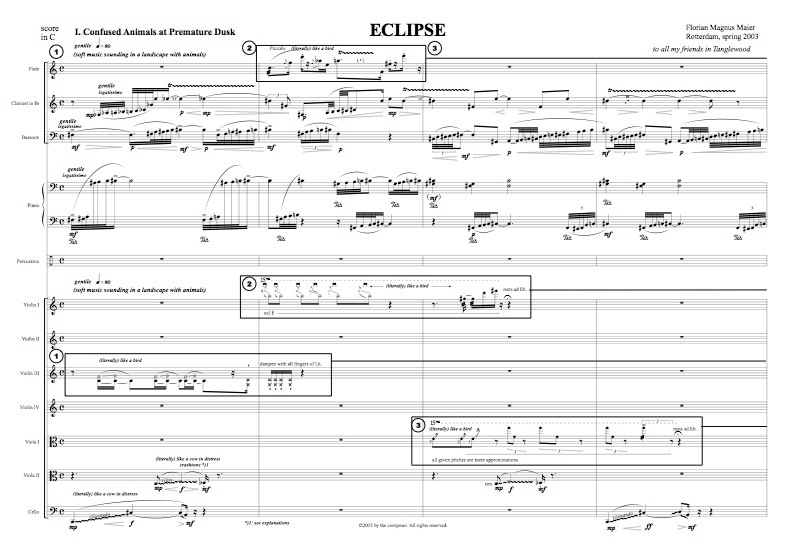 The textures and harmonies represent the changing of the light, developping from the gentle “evening music” of the beginning to an out-of-place nightfall which plunges into sudden darkness in the third and central section Eye of God: Eclipse. Here, the chords and their orchestration invoke a sense of overwhelming, transfiguration at seeing the stars shine at noontime and falling into a cosmic abbyss, mounting in a tutti-violin solo expressing this combination of agony and perplexity. As it came, so this galactic disturbance disappears as the sun returns in time-lapse, dispersing the spell and restoring the order of the day. The world starts to breathe again, and the lingering sense of momentary magic is swallowed up by the return of the sounds of daily life, the profanity of which is represented in the intrusion of a radio in the distance that awakens the beholder from his transcendental vision.